RemeGenix works with a variety of different collaborators in order to cost-effectively, and efficiently develop its pipeline. Specifically, RemeGenix has relied on its scientific founder for substantially all of its pre-clinical research and development to date, and has lined up additional partners to work with the Company on the next developmental milestones including but not limited to: drug optimization, manufacturing, and pre-clinical and clinical development activities. To this end, RemeGenix works with various specialized contract research organizations (CROs) on various activities that would be cost prohibitive (or simply inefficient) to perform internally. At the same time, this virtual model of operating leverages the expertise of a team of experts who have routine experience with and exposure to the FDA. The Company is open to additional collaborations in its Therapeutic pipeline MoBA, as well as its Drug Development platform NoMAD. If you think you have a technology that would be a fit for us, please contact us here. RemeGenix is developing MoBA; a disease modifying drug to treat Alzheimer's disease. 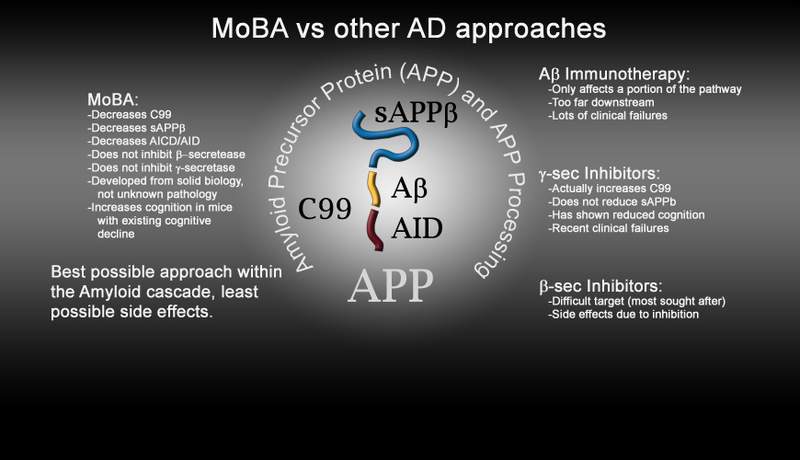 MoBA has one of the best possible safety and efficacy profile, among all of the drug candidates currently in development. The Company's therapeutic and platform technologies were developed from a comprehensive understanding of the relationship between a protein named BRI2 and Amyloid Precursor Protein (APP). BRI2 was found, by Dr. D'Adamio, to be the natural binding partner of APP, and is responsible for protecting APP from being cleaved (cut into smaller pieces) by a variety of different proteins/secretases including the beta and gamma secretases. Importantly, individuals who have a lack of functional BRI2 have been found to have significant cognitive deficits, and similarly the mice Dr. D'Adamio created, the basis for our NoMAD platform technology, demonstrated the same cognitive deficits that are also associated with Alzheimer's disease. The mechanism of action of our pipeline is specific and is less likely to inhibit normal, ongoing biological processes. Current alternatives focusing on divergent pathways will more likely have side effects when administered to patients, and have shown such side effects in recent clinical trials. RemeGenix' technology has the potential to compete on a cost and efficacy basis with other products in this disease space. RemeGenix' technology is potentially applicable to multiple types of dementia and cognitive disorders. RemeGenix' approach has been validated in animal models of disease as well as a human disease. 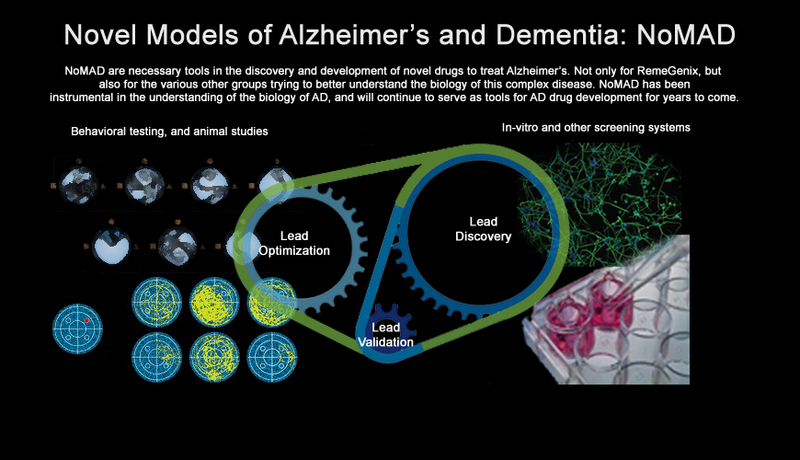 RemeGenix' Novel Models of Alzheimer’s and Dementia are specifically designed animal models that will serve as a drug development platform for not only RemeGenix' internal needs, but will also serve as a catalyst for a number of different partnership opportunities. The Company’s co-founder has recently published several manuscripts discussing the most recent and compelling data, and the Company will continue to work diligently to ensure that this model will become one of the preferred animal models used in the development of drugs to treat Alzheimer’s and/or dementia today. We are hopeful that the industry in general will realize, from the recent failures in this space, that the existing models are not appropriate, and that they lack biological relevance to the human disease. Our models are biologically relevant to existing human dementia and have been shown to have significant cognitive decline independently of plaque formation. Dr. D'Adamio developed this model by mimicking the genetics of human disease, instead of developing a model with a specific pathological readout. By creating genetically faithful models, we will be able to rapidly and accurately translate our drug development efforts to the clinic, and significantly reduce our risk of failure. Problems with Current Models: As discussed above, the existing models of AD are faulty, and have been built on a preconceived idea that plaques are the key to the cause of the disease. Unfortunately, in order to generate Amyloid plaques in mice, researchers have discovered that gross over-expression (thus making the model irrelevant to human biology) of many human mutations in mice is necessary. This has resulted in the generation of models that are genetically irrelevant to human disease. The fact that numerous therapeutic approaches that have showed promise in mice but have failed in humans is a strong indication that these mice do not model the true pathogenic mechanisms of human AD.